This was a semi-official limited edition single on the Caff Corporation label. It is not to be confused with the earlier and more well-known My Legendary Girlfriend single released by Fire Records. The Caff label was run by Bob Stanley, a friend of Jarvis', who is most well-known as a member of the band St Etienne. He established Caff in 1989, releasing only one-off 7" singles. 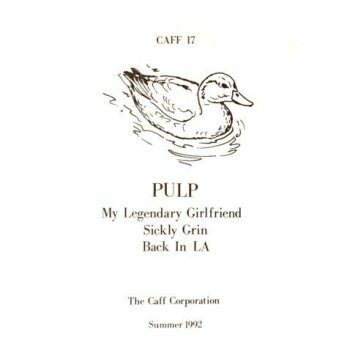 Pulp's single was the label's final release in September 1992. Copies of this single are now rare and sought-after. None of the recordings included here are readily available elsewhere. Back in L.A. did appear on an obscure compilation cassette in 1987. This is a bit misleading: Back in L.A. was recorded in November 1984, while Freaks was not recorded until 1986.